Cheeseburgers aren't exactly health food, even though the lettuce and tomato they (sometimes) come with are basically salads. But in the interest of tipping you off to the most- and least-healthy burgers, we spoke to Ruth Frechman, a registered dietitian nutritionist, to help us look at eight major fast-food joints' cheeseburgers. 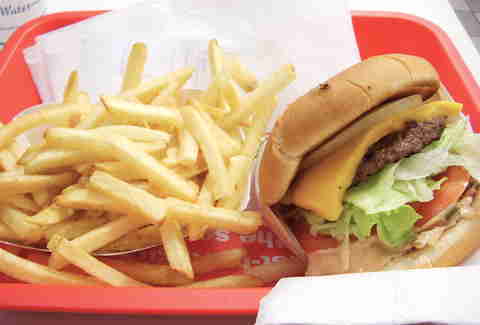 Here's the lowdown on America's favorite cheeseburgers. Editor's Note: The list is comprised of each restaurant's standard cheeseburger, with the standard fixings. Because it's unfair to compare apples to Baconators. With 17g of saturated fat, this burger has the most out of any burger we looked at. 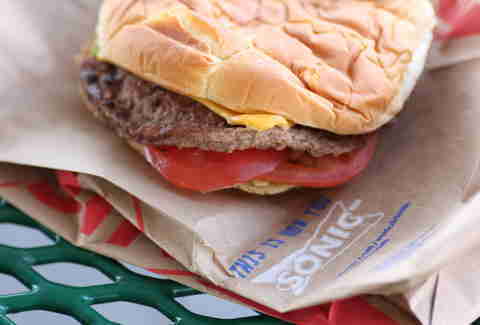 Sonic also leads the pack in fat (43g), protein (35g, and not such a bad thing! ), and cholesterol (120mg). We recommend working off that fat by rollerskating around a parking lot, or maybe going on a milkshake cleanse. 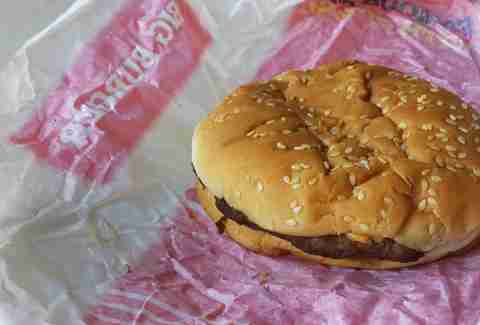 A big cheeseburger means big calories (557) and more grams of trans fats (2g) than any burger in this ranking. Jack's offering also features an amount of cholesterol (80mg) equal to both the McDonald's and Burger King cheeseburgers combined. Speaking of which, a McDonald's + Burger King super cheeseburger sounds like something worth trying... if only they'd set aside their differences. Wendy, America's favorite pigtailed redhead not involved in the adult industry, makes a burger with 1,180mg of sodium, more than any cheeseburger mentioned here. 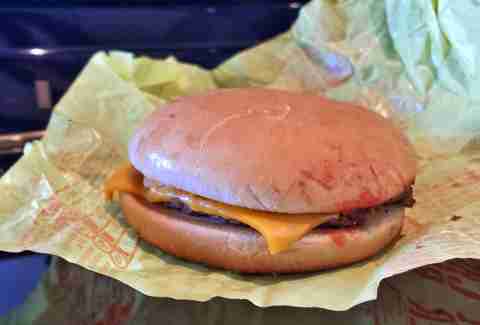 And it contains a higher amount of cholesterol (100mg) than most. But it's also square. The changed geometry probably adds some extra nutrients, right? 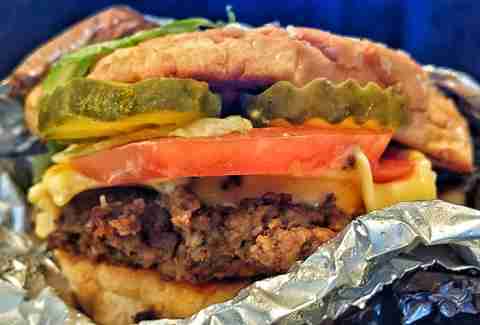 Oh, how I laughed and laughed when I saw Five Guys' cheeseburger came in fifth place. Really makes you believe in something greater than yourself, doesn't it? No? Regardless, the important takeaway here is that this has a more calories from fat count (290) and cholesterol (85mg) than most of the other burgers, but a lower sodium (690mg) count. 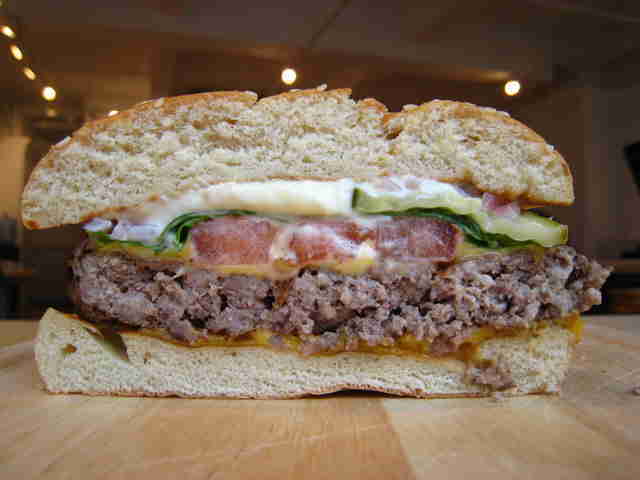 For a big burger, it's got less saturated fat (11g) than the burgers mentioned previously. On the downside, it does have significantly more carbs (57g) and sodium (1,150mg) than the burgers you'll see in our top three. But overall a good showing for Hardee's burger-brother-in-arms. 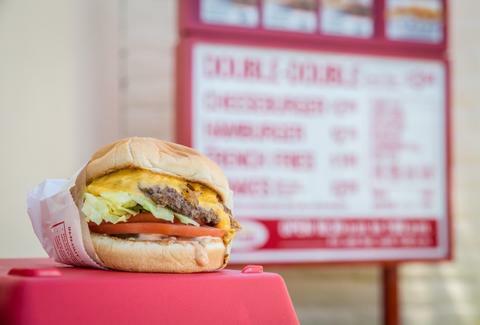 Even though you're probably getting this sucker as a Double Double, Animal Style, if you stick with the standard-build cheeseburger, this is a much healthier option than some of its fast-food peers. That owes to its relatively low level of saturated fat (10g) and cholesterol (60mg) -- mind you, that's relative to other burgers, not to a bowl of steamed kale and grilled chicken, but at least it tastes good! 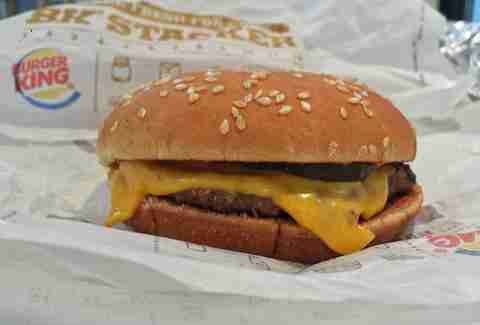 The chain that broke America's brain (in a good way) when it started serving breakfast anytime serves up a cheeseburger with only .5g of trans fats, almost half the amount of sodium (680mg) as most of the other burgers, and nearly half the cholesterol (40mg). No wonder Ronald has looked so svelte after all these years and can finally fit in skinny jeans. BK is the king of this burger battle, as it boasts the least amount of saturated fat (5g), total fat (12g, tied with McDonald's), carbs (27g), sodium (560mg), and cholesterol (40mg, also tied with McDonald's). 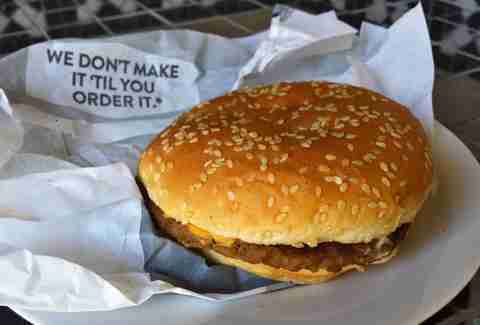 Granted, it doesn't have the mayo or the 1/4lb of beef found in BK's signature Whopper, but you can eat it safely knowing it's the healthiest basic fast-food cheeseburger on the market. 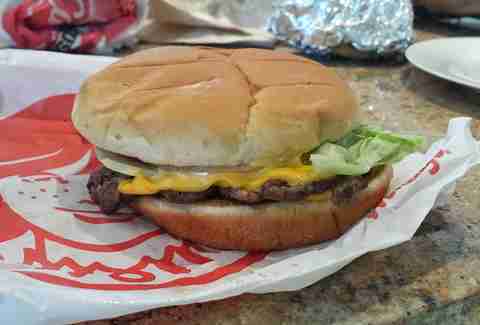 Lee Breslouer is a senior writer for Thrillist, and could go for a Sonic burger right about now. Follow him to cravings: @LeeBreslouer.